Abraham Lincoln (1809-1865) - Whenever surveys are conducted as to who was the greatest US president in history, Abraham Lincoln consistently appears at or near the top of the list. And the reason is simple; because he ended slavery in America, and preserved the Union after it had been torn apart by civil war. He is so highly regarded in American society that two states claim him as theirs; Kentucky where he was born, and Illinois where he lived as an adult. One of the most popular landmarks in Washington D.C., the Lincoln Memorial, honors him; as does Mt. Rushmore, on which his face appears. And two of the most important moments in presidential history are his; the Emancipation Proclamation, which freed the slaves in 1863, and the Gettysburg Address, which captured the embodiment of the struggle to save the country from division. Much has been made of his childhood. Tales of how he traveled miles on end just to go to school and receive and education. 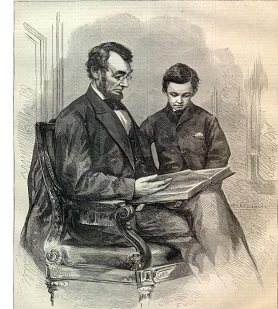 In fact, Lincoln was largely self-educated. Learning was one of his great interests and he read constantly in his free time. He taught himself law and was admitted to the bar in 1836. Soon he was practicing as a lawyer in Springfield, Illinois. But he was deeply interested in politics as well and was elected to the U.S. House of Representatives in 1846. In 1858, while running for the U.S. Senate he participated in one of the most famous series of debates ever with Stephen Douglas. He lost that election, but the race prepared him for the presidential election only two years later. It would prove to be the most divisive election in American history as it literally tore the country apart. The big issue, of course, was slavery. Although Lincoln was personally against slavery, he gave no indication at the time that he would abolish it, nor was he even sure he had constitutional grounds to do so. But that made no difference to the slave-holding states. They wanted to expand slavery to new states coming into the union, and Lincoln opposed that. Even before he was elected, they threatened to secede from the union if he became president. Because of the division across the country the race featured four major candidates. The Democratic Party split in two along geographic lines and put forth two candidates; one from the North and one from the South. The old Whig Party transformed into the short-lived "Constitutional Union" Party which produced a candidate of its own. That left the newly-formed Republican Party, which nominated Lincoln (he is considered the father of the Republican Party as he was its first national candidate). The Republican Party was united in an otherwise divided election which allowed Lincoln to carry almost all the northern states and win the election (with only 40% of the popular vote). True to their threat, seven slave-holding states seceded before Lincoln was even inaugurated as the 16th president. But the federal government refused to recognize the self-declared Confederate States of America and kept troops stationed in the South. War broke out on April 12, 1861 when the Confederacy fired on Union controlled Fort Sumter. The Civil War, the most devastating conflict in American history had begun. It lasted four years and took over 600,000 lives. Plus it left much of the South in ruins. The war opened raw wounds that would take decades to heal. But in the end, the Union was held together and Abraham Lincoln deserves the majority of the credit for it. But he would pay for it with his life. On April 14, 1865 he was assassinated by John Wilkes Booth at the Ford's Theatre in Washington D.C..